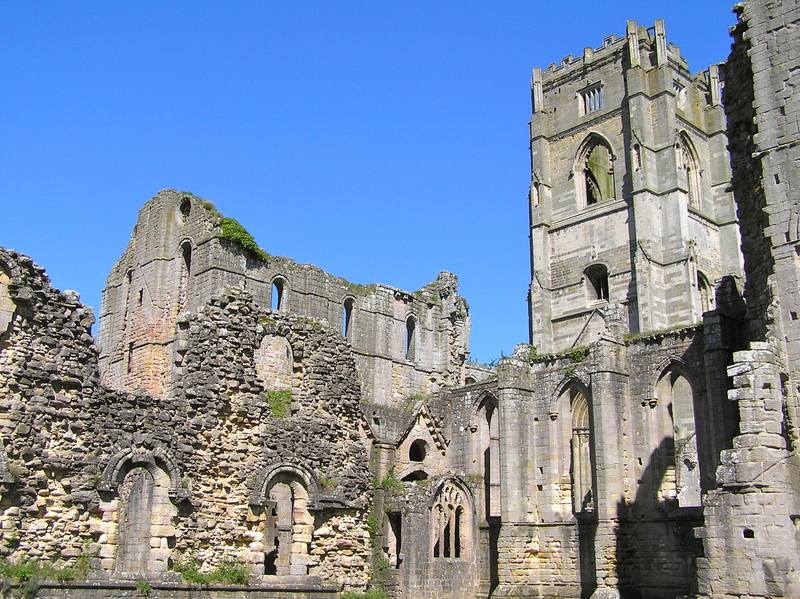 Founded in 1132, Fountains Abbey is the largest monastic ruin in Great Britain. 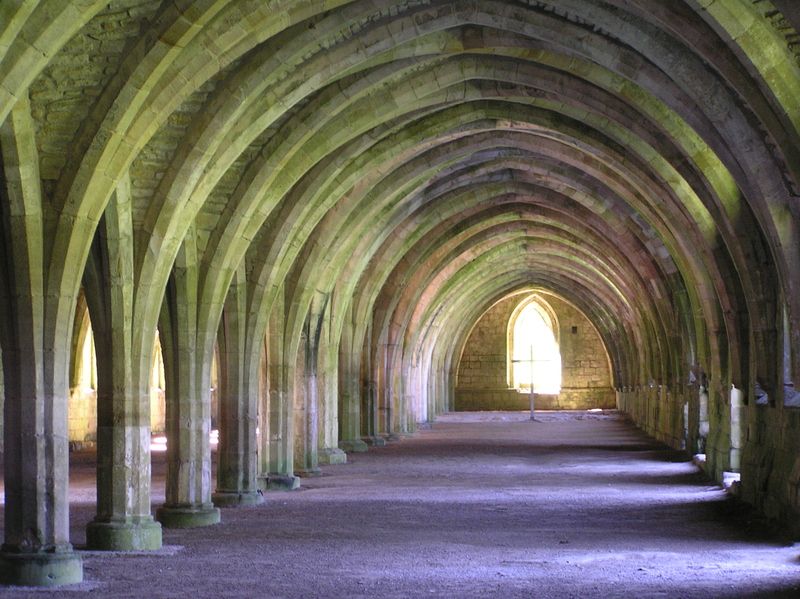 This, and its role in history, has earned it a place on UNESCO’s list of World Heritage Sites. So, of course, I had to see it when I was in the area. Nevermind I went with my 8-month-old and a friend who had a baby the same age – and the grounds were not generally “stroller-friendly.” One can’t expect ancient ruins to accommodate modern conveniences. As we started down the path away from the visitor’s center and into the gardens, I set my expectations low as far as what we might be to able access with our baby buggies. I always recommend keeping expectations low when traveling with babies, then you’re sure to exceed them. 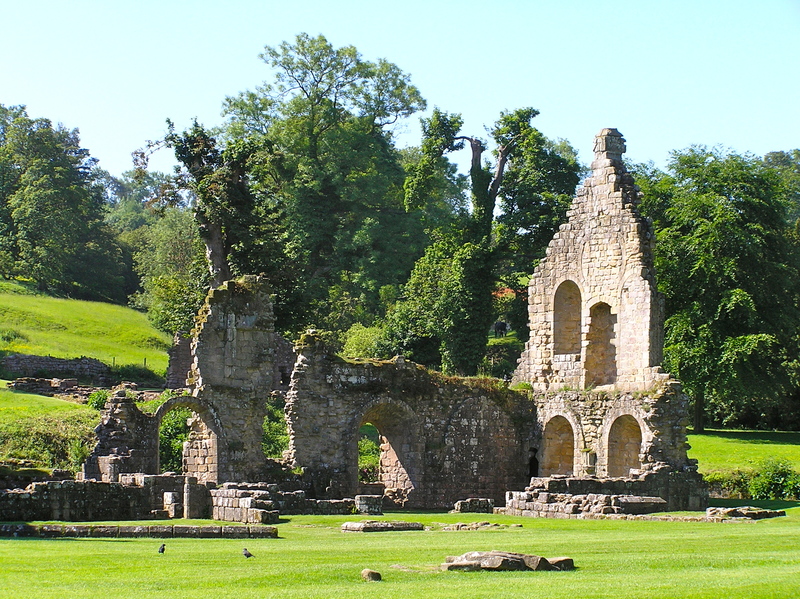 When we broke through the forest that sunny morning in June, we were rewarded with an expansive view of the ruins and the blindingly green grass. 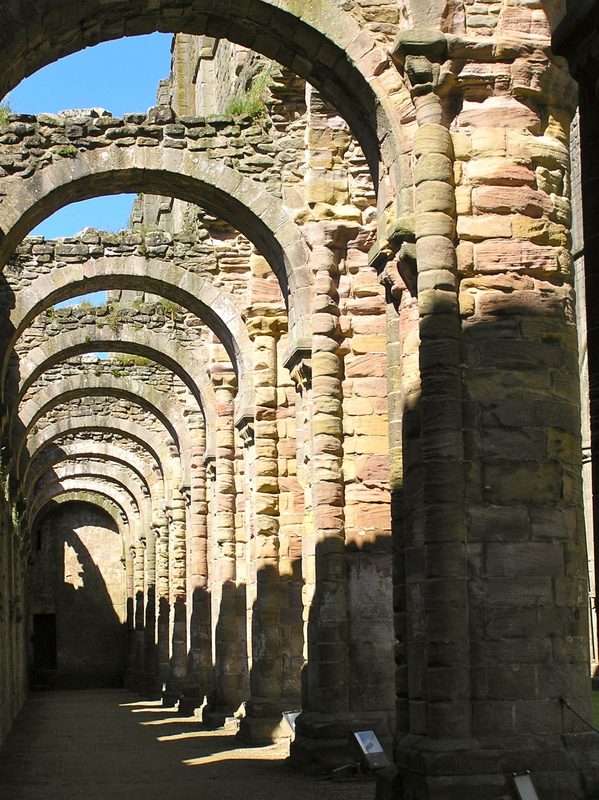 We ventured off the path, down the green slopes and into the shadows of the massive walls and arches. It’s a little rough pushing a stroller over original cobblestones. Reminds me of our visit to Pompeii. They didn’t grade these ancient halls for strollers either. . . After touring the impressive ruins, we began a stroll around the water garden. Immediately the path led us up a very steep, gravel slope. Very steep. Without missing a beat, my dear British friend quipped “Hips to hawndles! Hips to hawndles!” What?! You can pay for advice like that or you can get it free from a friend who’s taken stroller exercise classes (like my friend has). Her instructor told her that when you go up a hill, place your hips as close to the handles as possible. Don’t bend over and push with your back. Hips to handles will give you the most effective workout without throwing a joint. “Hips to hawndles! Hips to hawndles!” A steep slope does not mean “not-stroller-friendly”. It simply means you have an opportunity to tone some muscles. 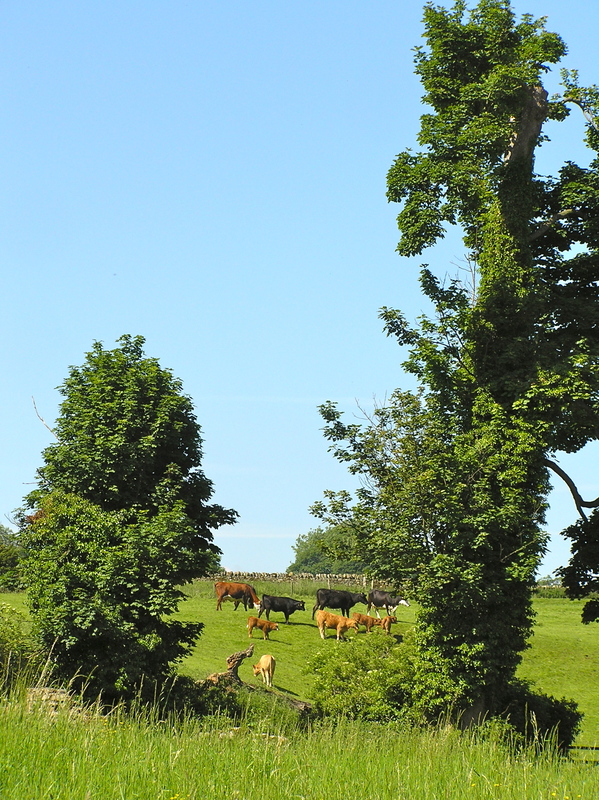 There is a short, steep hill near my house that never fails to make me think “Hips to hawndles! Hips to hawndles!” in a lovely British accent. 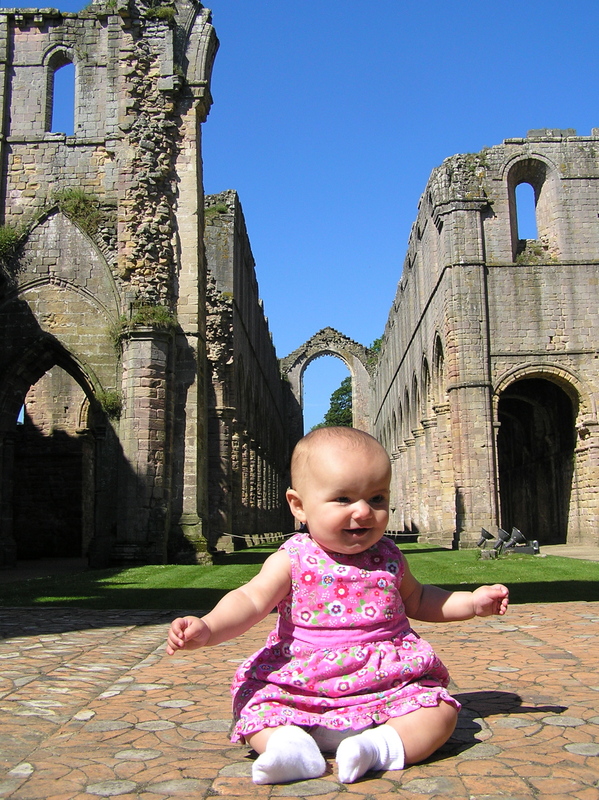 Indeed, every time I encounter a hill with my stroller, that refrain rings in my head and I see Fountains Abbey, green grass and blue sky. It’s my mental escape from the agony of a so-stroller-unfriendly hill. 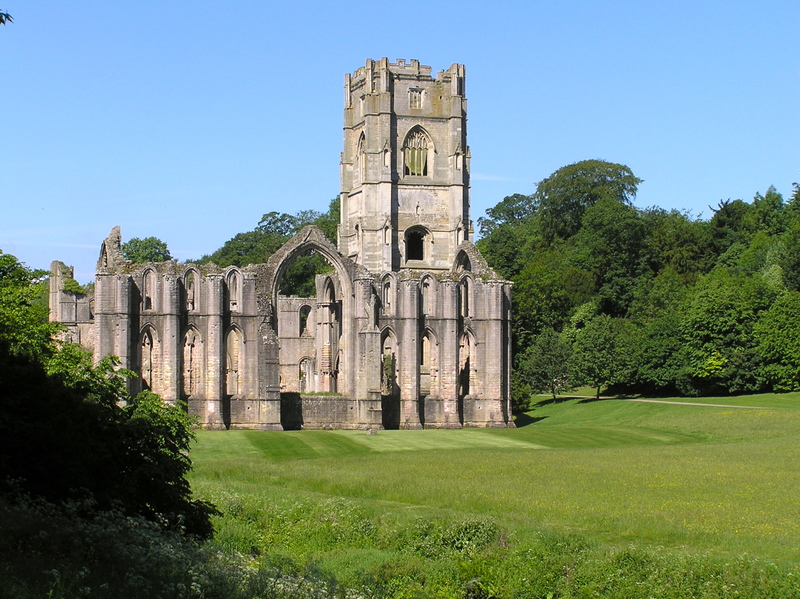 For information on Fountains Abbey, visit the British National Trust website. For information on stroller exercise classes, ask a friend. And for a little motivation to maybe leave your stroller behind and get off the well-worn path, read this related post: Stroller-confined.